Chelation is the process of removing unwanted materials from your body (usually heavy metals). I have patients showing signs of metal toxicity all the time, and when I tell them about this possibility, many times I hear comments, like "where would I get poisoned with that?" Remember, mercury is in amalgam fillings, cosmetics, plastics, pesticides, adhesives, floor polishes, tattoos, hair dyes, fabric softeners, and often in large game fish like tuna. Cadmium is present in cigarette smoke (and e-cigs vapor), car exhaust, coffee, gasoline, steel cooking pans, tap water, batteries, soda, refined grains, and processed foods. Many put aluminum on themselves daily in the morning, cook and store with aluminum, eat aluminum antacids, and drink from aluminum cans or cartons lined with aluminum. Lead is found in many lipsticks (and eye liners), gasoline, pottery, insecticides, tobacco smoke, car exhaust, car batteries, crayons, and hair coloring. Arsenic is found in both organic and inorganic forms. Inorganic arsenic is found high in drinking water in several places of the world like Bangladesh, India, Taiwan, and China. Organic arsenic is commonly found in seafood. Rice and rice derivates including adult / baby cereals and rice-based gluten-free products (even from organic rice) are often high in inorganic arsenic. This is due to lead-arsenic pesticides that were previously used on cotton and other agriculture in the 1910s to 1980s (particularly a problem in Arkansas, Louisiana, Missouri, and Texas – where much of our rice comes from). Conventional juices have also been found to be high in arsenic. So the question then becomes who is not exposed to these metals. 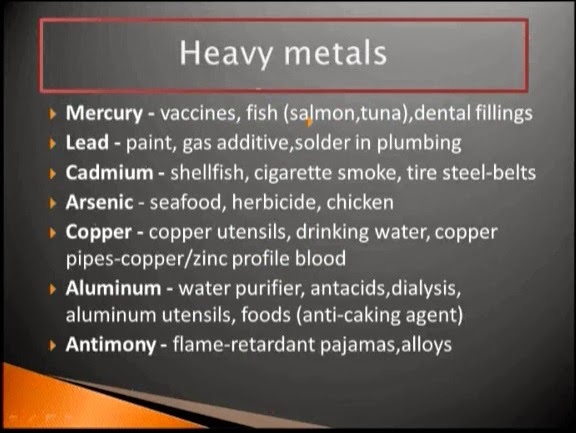 These metals are really just the tip of the iceberg of chemical exposures that everyone encounters on a daily basis. 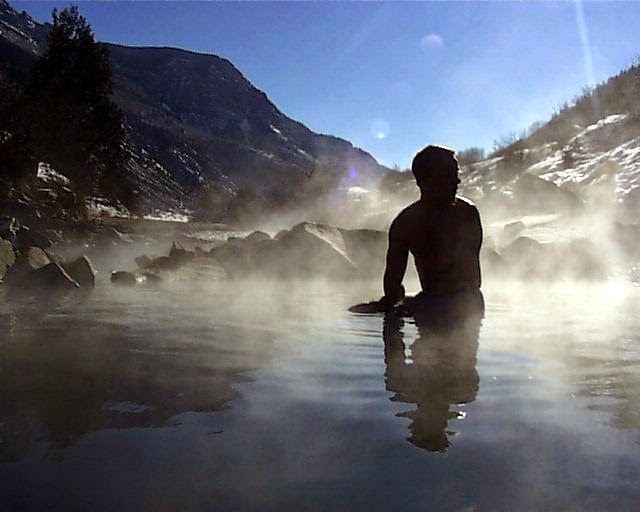 Some great detoxification / natural chelation options include sweating, supporting a healthy gut microbiome (diversity of fermented products, probiotics, and prebiotics), taking epsom salt bath soaks, and eating more cilantro, garlic, onion, apples, lemon water / juice, cabbage, artichoke, olive leaf, broccoli, and carrot juice. Evidence exists in regards to using dandelion, selenium, and chlorella. There are many other types of detoxification schemes as well, including "colon cleanses" as well as oral and IV chemical chelation. Living a clean life and avoiding exposure to heavy metals is obviously the best prevention strategy. Drink plenty of clean water. Keep and eye on your everyday products by checking them at the Environmental Working Group (www.ewg.org). Below is a reference to a study in JAMA showing a 20% reduction in cardiovascular events using IV chelation therapy. ADDENDUM: Dr. Menolascino in his talk on 9/14/2014 at the Evolution of Medicine summit mentioned that the average American woman walks out of the house in the morning with 105 toxic chemicals put on her. And he also mentioned that one of the best ways for a woman to detox is to have a child. All of the toxins accumulate in the fetus. Conclusions - Among stable patients with a history of MI, use of an intravenous chelation regimen with disodium EDTA, compared with placebo, modestly reduced the risk of adverse cardiovascular outcomes, many of which were revascularization procedures."